Was hungry NOW. Usually when I’m hungry NOW, I end up filling up on cheese and crackers while I figure out what to cook for dinner. Then I start cooking. Then I eat more cheese and crackers or maybe a brownie or more than likely a couple of gigantic garlic-stuffed olives that I keep in my fridge for emergencies. But I’ve been watching my weight, so I figured if I could fix dinner fast, I’d avoid the extra pre-dinner calorie gorge. Skinless, boneless chicken thighs were awaiting. (Thighs cook quickly when untucked and opened flat, butterfly style.) So, I narrowed it down to either lemon chicken or, hmmm, Parmesan chicken. Parm chicken won because I just happened to have a chunk of Wisconsin’s own Sartori SarVecchio Parmesan in my refrigerator. It’s rather awesome. It has big sharpish taste and that same crystalline-crunch of Parmigiano-Reggiano. (I buy local not to just buy local, but because it tastes remarkable). I also had a little bit of grated Parmesan in the fridge, too. You know. Green can o’ Parmesan. Couldn’t resist combining the two. But you can use one or the other if you don’t want to use both. 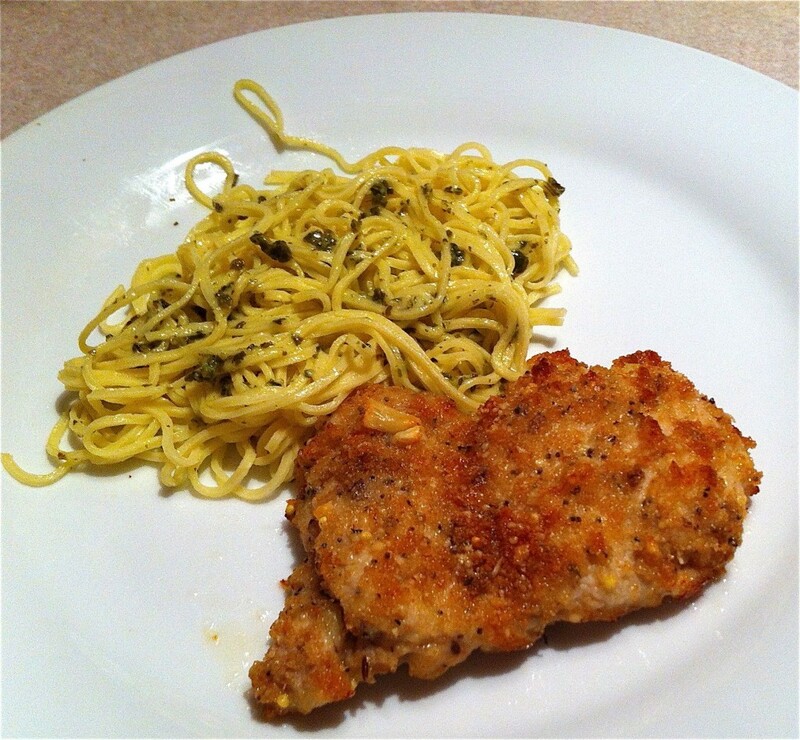 I served the chicken with pasta tossed in pesto. And a salad. And now I’m happy. Here’s my recipe. It serves 6. Guess what I’m bringing for lunch tomorrow? 1. Preheat oven to 425°F. Combine butter and garlic in a small skillet. Heat (low) until butter melts. 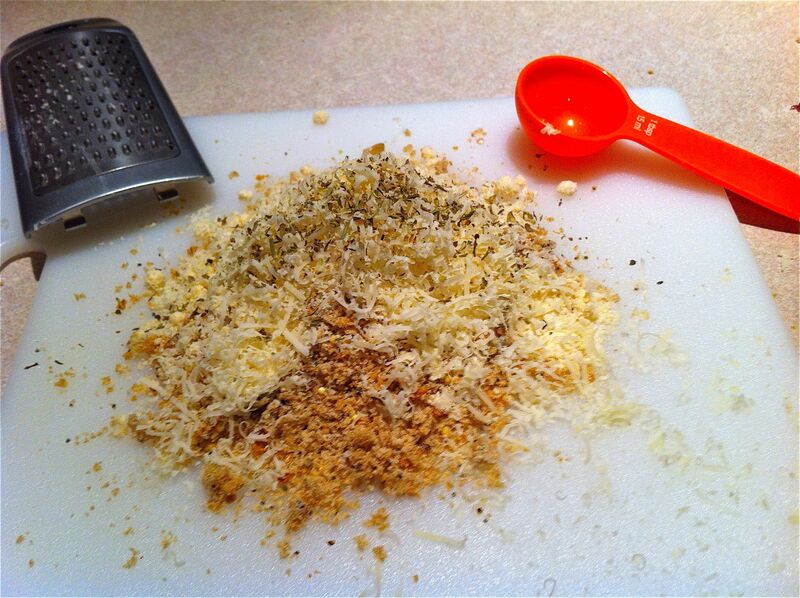 In a bowl combine bread crumbs, Parmesan, Italian seasoning, and pepper. 2. 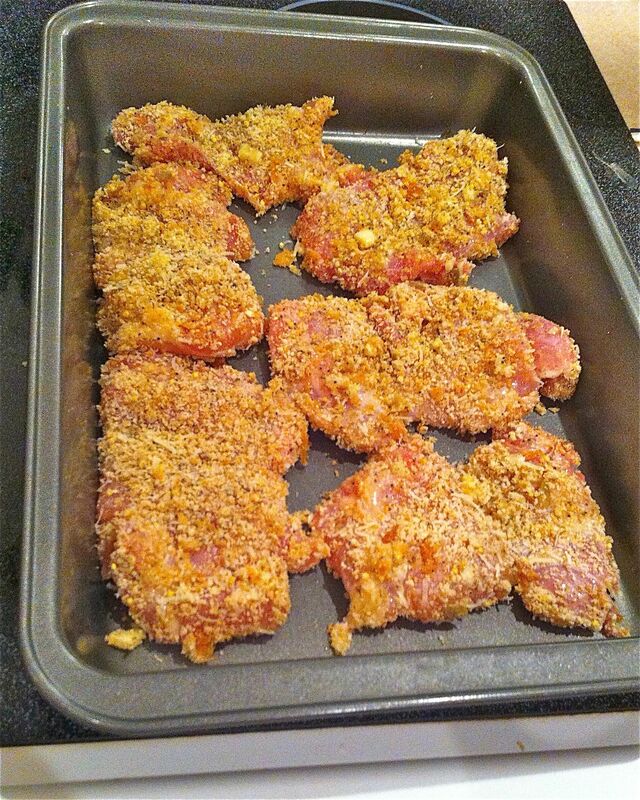 Dip chicken in garlic butter (both sides), then into crumb mixture to coat. Put chicken in a 9×13 baking pan. Drizzle with remaining garlic butter. Bake, uncovered, for 15 minutes or so, or until chicken is cooked through (165° F).